I recently had the pleasure of staying at Club Quarters, Gracechurch in London, England but was in two minds whether to write a review! This is such a lovely hotel at reasonable prices in the centre of the city that I was not sure I wanted to share it. The hotel is very central and easy to get to. I used the underground. The stations at Monument and Bank are close by. It is also easy walking distance to London Bridge. Staff at the hotel are charming and helpful but not intrusive. There is free wi-fi throughout the hotel and a docking station for i-pad, tablet or lap-top in the room. Indeed, I will struggle to say anything negative about Club Quarters Gracechurch, I think it is one of the best kept secrets in London. So I hope this review will not sound sycophantic. I suppose it is not an ideal place to take small children, but it is not designed for young kids. 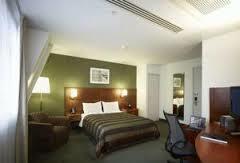 It is really designed for the business traveler or those visit includes a business element. For me, many trips, even of a social nature, involve a business element and I suspect I am not unusual in that. The hotel has a smart exterior and the reception desk is manned 24/7. I did not use room service,the restaurant or the fitness suite, so I cannot comment on these except to say they are all available. My room was large for a city centre hotel and the en-suite facilities, although dated were spotlessly clean, and that floor of the hotel was in the process of being modernised, so I suspect when I go back that will have changed. The view from my window was not great, but I do not ever go to a world city to look out of the window. The bed was a king-size bed and the air-conditioning and heating system are very effective. There are computers and meeting facilities available to guests and special arrangements for printing boarding passes and travel documents. The hotel is so well situated within the city that I was able to conclude my business meetings and also have time out with easy transport to the theatre in the West End and to catch up with family and friends over dinner. Do I recommend Club Quarters? Yes but not for family holidays with young children. Would I use this hotel again? In a heartbeat!